With 239 guest rooms – including 28 suites – The Mission is somewhat larger than the average “inn”. It should be noted, however, that the existing hotel represents a gradually expanding building based upon the original 12-room boarding house of 1876. President Theodore Roosevelt stayed here not long after the completion of the Mission Wing in 1903 – he also took part in the ceremonial replanting of one of two orange trees in the courtyard of the hotel. 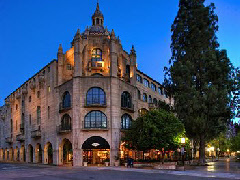 It is also said that Pulitzer Prize-winning author Hamlin Garland wrote parts of his works in the Alhambra Suite, while Bette Davis was married here in 1945. Other notable guests include Presidents Benjamin Harrison, William McKinley, William Howard Taft, Herbert Hoover, and John F Kennedy; countless actors and actresses including Cary Grant, Clark Gable and Sarah Bernhardt; and international icons such as Albert Einstein, William Randolph Hearst, Joseph Pulitzer, and Henry Ford.